Medeama coach Samuel Boadu has moved to water down the title expectations of his team, insisting his troops are ‘still growing up’. The Mauve and Yellows have underlined their title credentials with a superb performance to end the first half of the campaign top of the table. The two-time FA Cup winners pulled the chest nut out of the blazing fire to draw 1-1 against Hearts of Oak in Cape Coast on Sunday. Hearts striker Aboubacar Troare scored the opener in the 37th minute to give the struggling Phobians a real sense of believe after dominating possession in the first half. However, substitute Tahiru Awudu broke the hearts of the home side with a world class equalizer with the last kick of the game. There is a growing positive reviews among Medeama fans in Tarkwa, sensing they could win their first ever Ghana Premier League. 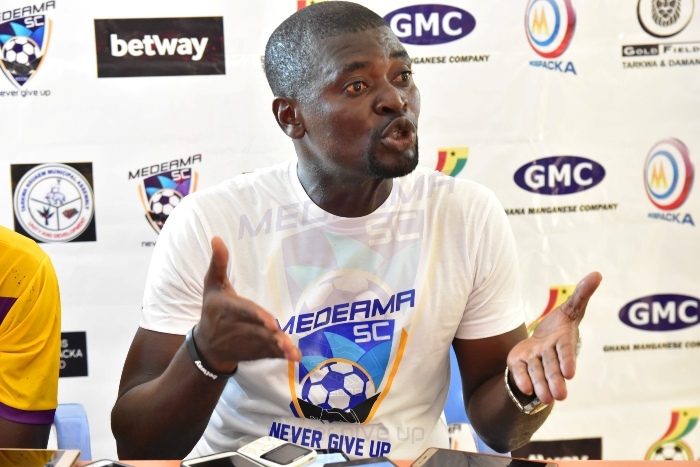 But coach Samuel Boadu has moved to water down growing excitement among Medeama supporters over the possibility of winning the Premier League title. “The pep-talk during recess and the substitutions we made did the trick. We knew it was always going to be difficult against Hearts. “They are not well-placed on the league table and so we knew they would come out strong and yes, they did. Medeama have simply been exhilarating in the first half after picking 27 points from 15 games to end the first half of the season on top of the table.